Columbia Tristar gave fans of special effects wizard Ray Harryhausen much to smile about with their first two releases of the maestro's work: Jason and the Argonauts and The 7th Voyage of Sinbad. Both discs contain virtually identical sets of supplements, which would also feature on other Harryhausen discs from Columbia: The Harryhausen Chronicles (a very nice hour-long documentary from 1997 which gives a pretty thorough overview of his career), This Is Dynamation (a three-minute contemporary trailer promoting 7th Voyage’s innovative special effects techniques), a recent twelve minute interview (conducted by John Landis) about Jason, and A Look Behind The Voyage (twelve-minutes of interviews and clips, copyright 1995, but looking much older). Trailers for The 7th Voyage of Sinbad, Jason and the Argonauts and The Golden Voyage of Sinbad complete the package. The extras almost deserve to be released as part of a more comprehensive stand-alone presentation. 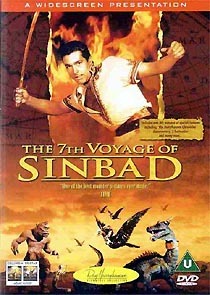 The 7th Voyage of Sinbad film is presented in 1.85:1 format, enhanced for 16:9 sets. The composition is a little tight, masking off picture information at the top and bottom of the screen that we’ve been used to seeing, but provides dynamic new compositions that will thrill the most jaded of viewers. The 1958 movie looks a little grainy, but it’s certainly an improvement on previous home video versions. Sadly Columbia seems to have dropped the ball where the film’s sound is concerned. This DVD offers only a mono mix, whereas the previous NTSC laserdisc release (a Pioneer Special Edition) was in stereo.